A peak inside the mind and private life of one of cinema's greatest ever directors, Hitchcock is a fictionalized account of the period leading up to his career's greatest triumph. Alfred Hitchcock (Anthony Hopkins) should be basking in the success of 1959's North By Northwest, but instead he is experiencing anxieties about his age, his weight, and finding his next project. Despite the objections of studio bosses, he decides to adapt the book Psycho by Robert Bloch, a horrific story of murder, mutilation and unburied corpses based on real-life murderer Ed Gein. With the studio refusing to fund what appears to be a salacious horror film, Hitchcock and his wife and frequent collaborator Alma (Helen Mirren) take the biggest risk of their lives by mortgaging their house to self-fund the production. 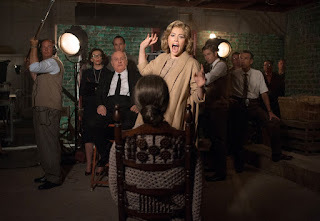 Alma starts to work on the script, while Hitchcock's loyal assistant Peggy (Toni Collette) leads a campaign to buy every copy of the book to increase the shock value of the film. Alma recommends Janet Leigh (Scarlett Johansson) for the lead, and Hitchcock is smitten with his latest blonde leading lady, much to Alma's disgust. Also cast are Vera Miles (Jessica Biel), who previously disappointed Hitchcock by placing her family first, and a tentative Anthony Perkins (James D'Arcy). The pressure on Hitchcock mounts and affects his health, especially once Alma starts to spend a lot of time with screenwriter Whitfield Cook (Danny Huston). Directed by Sacha Gervasi, Hitchcock is compact and tightly focused on the turmoil that often accompanies the creative process. Running at just 98 minutes, the film packs in the ups and downs of the journey from idea to final film, and reveals plenty about the man by zooming in on a short pivotal period in his life. Remarkably Hitchcock dissects Psycho without showing a single frame of the celebrated film. The boundary-bashing elements of the film are revealed through clashes with the Motion Picture Production Board, while a stellar highlight is achieved as Hitchcock conducts every frame of the shower scene, alone in the empty theatre lobby outside an early screening. But this is a film as much about the man as the movie. Hitchcock hints strongly at the director's character weaknesses, including an inability to control his appetite. Perhaps related is a blatantly wandering eye, and a lust to dominate women manifested in a search for an idealized vision of a perfect blonde. In Alma Hitchcock has found and married his perfect life partner, but now looks past her and cannot help but flirt shamelessly with younger women while displaying obsessive and manipulative traits. The film stops short of veering towards anything darker in Hitchcock's observed behaviour towards women. Gervasi instead chooses the more imaginative route, getting into Hitchcock's head for fantasy scenes of interaction with murderer Gein (Michael Wincott), and suggestions that the financial and artistic stresses triggered suppressed thoughts of violence towards the finally fed-up Alma. And her essential role in Hitchcock's success is a key theme of the film, Alma indeed emerging as the rational creative force balancing his arrogance and showmanship. Anthony Hopkins grows into the role as the film progresses, capturing Hitchcock's well-known mannerisms. Mirren matches Hopkins as the less showy and more grounded Alma. 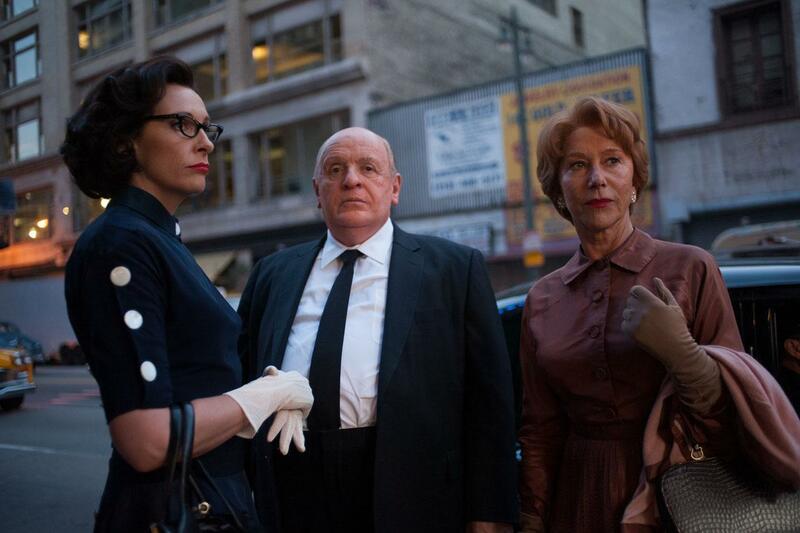 Scarlett Johansson and Jessica Biel provide adequate support in smallish roles representing different dynamics between Hitchcock and his actresses. The success of Psycho as a seminal cinematic achievement is now taken for granted. Hitchcock pulls back the shower curtain to reveal the self-doubt, determination and strife holding hands with genius.